Bill Powell (John W. Powell) died suddenly on December 15 at the age of 89. Obituaries (New York Times, 12/17/08) focused on the sedition trial of the 1950s in which Bill, wife Sylvia, and Julian Schuman were pilloried for repeating in the Shanghai English language weekly, China Weekly Review, the charge that U.S. forces used germ warfare in the Korean War. The story of their defense is a remarkable one of personal courage and tenacity – and of course it should be addressed. The ordeal made McCarthy hysteria martyrs of the Powells. But there is another, more Chinese story to tell about Bill Powell. 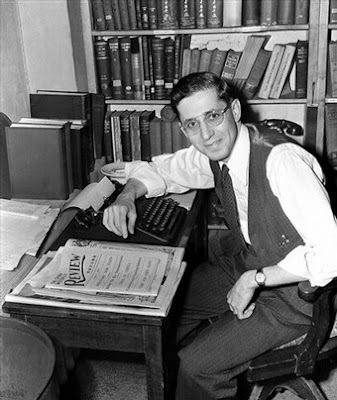 Bill was a central figure, one of the few who survived into the twenty-first century, among a group of young men and women from the West (mostly American) who reported on the China theatre during World War II. In the face of censorship, language barriers (the country was a check-board of regional dialects), and the horrors of daily bombing raids, Powell and others dug for stories and then found various means to get their stories out and in print. Their reports marked the most extensive news coverage at that point of a non-Western country in the Western press. Bill’s comrades included John Hersey, Teddy White, Harold Isaacs, AT Steele, Til and Peggy Durdin, Jack Belden, Anna L. Jacoby, Stewart Alsop, Mac Fisher, Chris Rand, Graham Peck, Agnes Smedley, Edgar Snow, and Freda Utley. What Bill lacked in age and experience was made up by the connections of his father in Shanghai (where Bill was born). By the mid-1920s, J.B. Powell – originally from Hannibal, Missouri – was a legend in the Chinese coast English language publishing world. He was editor and eventually publisher of the China Weekly Review, the most widely read and quoted publication (often in the Chinese language press) of its kind in China. By the 1930s , the editorial stance of the Review was virulently anti-Japanese. In December, 1941, J.B. was arrested in Shanghai and badly tortured by the Japanese occupation forces. Fresh out of college, Bill was 22 years old when he returned to China as a war correspondent. When Bill arrived in Chongqing shortly after Pearl Harbor, he knew only that his father was in a concentration camp. Bill was assigned first to Chongqing, which he found stifling. As soon as possible he volunteered to go to Guilin as an officer in the Office of War Information as well as a stringer for Christian Science Monitor, Chicago Daily News and other publications. His father’s connections gave Bill access at the highest level to Chinese government officials, both Communist and Nationalist (remember China was nominally fighting at this point as a “united” front). These included figures like Chiang Kaishek and the Madame, H.H. Kong, T.V. Song on the Nationalist side and Zhou Enlai and Gong Peng on the Communist side. On the American side, he was part of the press corps covering the tumultuous relationship between Generals Vinegar Joe Stilwell (Army) and Claire Chennault (Air Force) as well as the shenanigans of the Navy Intelligence chief Milton (Mary) Miles. The high point of his war reporting years, Bill told me, were his years in Guilin (in mountainous Guangxi province, northwest of Canton). He was there from 1942 until the city fell to the Japanese in 1944. Besides being more picturesque than Chongqing (as it still is), Guilin was much freer politically and culturally – free of Chiang Kaishek’s secret police or juntong led by the infamous Daili. A group of different Generals, not Chiang Kaishek, had controlled the province as an independent power base since the 1920s. The most important of these in Bill’s time were Generals Bai Chongxi and Li Jishen. Annual celebrations of General Bai’s mother’s birthday was the biggest holiday of the year. Thus from Guilin Bill got stories out, about dramatic rescues of downed U.S. plane crews, for example. He was able to report with less censorship and in a more balanced way on the battlefield developments and political rivalries going on around him. Bill also thought that the partnership between the U.S. and Chinese allies worked better in Guilin, with a lot going on beneath the surface. Guilin was a center of intrigue between British, American, and Chinese intelligence operatives – in all sorts of ways. For example, Ho Chi Minh surfaced in Guilin, soliciting and winning support from the O.S.S., after a bad spell in a Chiang Kaishek prison (in Chongqing). There were collisions between British and U.S. intelligence about how to best conduct clandestine operations in Burma, and so forth. At another level, Guilin was exciting because it enjoyed a flowering as a sort of wartime cultural center, attracting prominent Chinese artists, writers, and poets. General Bai bankrolled the major daily paper, Aobei ribao, whose editorial board had strong communist leanings. There were even important western cultural figures passing through, including Hemingway. Bill remembered being amused by Robert Payne, the poet and translator, who was married at the time to the daughter of a Beijing aristocrat, wandering around Guilin with long hair, sandals, and a rope holding up his pants – to Bill anticipating the beat generation he saw in San Francisco in the 1950s. In 1944 Bill was one of the last out of Guilin before the arrival of the Japanese as part of the Ichigo offensive. He covered the tragic torching of the city before the Japanese advance which included the U.S. forces blowing up the state of the art hospital they had just opened. Bill never forgot the Guilin (and Chongqing) years. They represented one of the high points of his life (another being his marriage to Sylvia in Shanghai and honeymoon in Lichang in 1947). Bill met Sylvia through Madame Sun Yatsen (Song Qingling). Of course his assumption of the editorship of the Weekly Review after the war (followed by the death of his father in 1947 in New York) was a milestone as well. As editors, Bill and Sylvia had the ideal catbird seat from which to view the Chinese civil war. By 1947 Bill saw the Communists as China’s best hope for the future and the Review’s reporting ran in that direction. (Ironic, because J.B. Powell had been a strong supporter of Chiang Kaishek and founder of the China Lobby in the U.S.). It is important to remember Bill’s role as a war correspondent and put it on an par with the later life experiences. He was the last of a generation of Western journalist-adventurers for whom China during the war became a romantic, courageous, revolutionary place. Their reporting broke with older styles of “treaty port” journalism because they attempted to report empathically on conditions as a whole in China. It was this generation who inaugurated a new era of much more varied and penetrating Western reporting on the Chinese situation and later on all of Asia– a legacy that still casts a shadow today. Readers may also be interested in China Reporting: An Oral History of American Journalism in the 1930s and 1940s by Stephen MacKinnon and An American Editor in Early Revolutionary China by Neil O'Brien. Love the story. Really like to know more western journalists' stories in China.